Recently Accuweigh were commissioned to supply platform scales to Everhard Industries on Queensland's Sunshine Coast to assist with correct positioning of heavy tanks on their trucks thus minimizing the potential risk of overloading fines. The concrete tanks are weighed on the platform scales and then marked with their net weight to allow operators to correctly position the maximum number of tanks across the truck body without exceeding the truck’s gross vehicle mass (GVM). Accuweigh’s A500 platform scales were custom manufactured in a 1500mm by 1500mm size to allow the concrete tanks to be more easily positioned on the weighing platform. To avoid prosecution under Chain of Responsibility legislation, everyone involved in the loading, transportation and unloading processes of goods needs to have a system in place to detect instances of truck overloading. These platform scales are only one such means of ensuring trucks are not loaded in excess of their GVM available from Accuweigh. 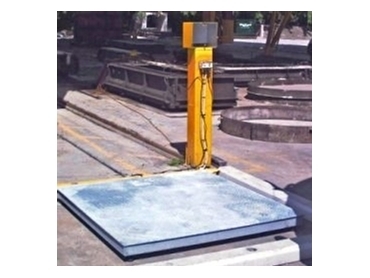 Axle scales, weighbridges and onboard truck scales area also available to help detect instances of truck overloading.